Honda Malaysia has two fresh Mugen concepts on show at the Kuala Lumpur International Motor Show (KLIMS). We’ve seen the Jazz Mugen, and then there’s the CR-V Mugen concept, which gives the fifth-gen RW a subtle makeover. Like with the Jazz, the Mugen treatment adds on bodykit styling elements, with the 1.5 litre Turbo variant getting a lower bumper extension and Mugen badge on the upper part of the grille. The sides also get lower body coloured extensions, and the rear also features a Mugen badge. Unlike the Jazz, the CR-V continues to ride with the same 18-inch alloys as found on the standard car. No mechanical changes either. The CR-V show car features the new Passion Red Pearl shade as first seen on the facelifted HR-V RS. 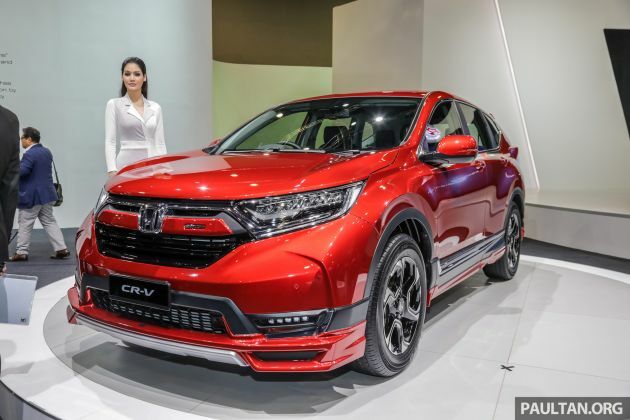 Word is that the colour is also likely to make its way on to the SUV in series form, and the likelihood of a CR-V Mugen variant appearing is, as we are told, quite probable. If that’s the case, it’s quite likely the red will be limited to the edition. As it is with the KLIMS Jazz, there are no changes to the interior of the SUV, but the production Mugen will not just come with exterior add-ons – expect some elements to be changed, and there will be unique Mugen trim. Honda CRV 1.5t qualify RON95 subsidy.. roadtax rm90. Buy CRV for sure get good long lasting quality, buy X70 for sure get good expensive service bills. CRV a skool mom’s favorite. CRV 1.5T is for B40, X70 1.8T is for M40. B40s will spend more time at service centers with their CRVs than on the road. This according to basher logic. If Press likevotes means you like X70. Ah yes, the ricers CRV. Add Mugen or J’s Racing JDM stickers. HP conpom naik 1000hp in their own minds. LOL. PURE NONSENSE .. MUGEN CRV IS PURE NONSENSE !! The PANDAI Buyers will not buy this lousy Mugen CRV..
Reason: Want to look sporty but got no POWER OR GUT to compete with those better ones from Germany and Sweden.. Anyone know why no one bother talk regards to honda CRV turbo engine oil dilution problem happen around the globe? Sure it is a big issue if the fuel mixture leak into the engine oil compartment. Just lucky enough to bump to it accidentally on youtube.